If you have a tablet, it’s likely that you are going to want something to hold it up at times. While tablets are amazing because they are so portable and versatile, they can also be somewhat of a pain if you want to type for an extended period of time or even check out some Netflix or YouTube in bed. Fortunately, while your tablet on its own falls short, there are plenty of tablet holders available to help your tablet perform even better. “Tablet stand” is actually a pretty vague term that can be used to describe anything that props your tablet up. It can be as simple as a little support that acts as a leg (akin to the one on the back of a picture frame that allows it to sit on a surface), or it can be something pretty complex that can hold the tablet up for you while you’re lying down. It all depends on your needs. Why do I need a tablet stand? Strictly speaking, you don’t. However, one of the biggest negatives to most tablets is that they have no way to be supported on their own, and thus require you to hold them. If you’re the kind of person who doesn’t mind computing with an object flat on a desk or in your lap, then a tablet stand isn’t a necessity. However, it can be advantageous in many situations to have something do the work for you. Where can I purchase tablet stands? There are tablet holders all over the place. In fact, sometimes you can even find them in tourist shops! However, you can generally get higher-quality tablet stands from electronics stores. All of the tablet stands that we have showcased in this article can be purchased on Amazon, and all of them are available on Prime. We always have an eye for quality, and we wanted to give you a wide range of tablets to choose from, depending on your needs. The needs of an executive in the boardroom are different from the needs of a parent, which are different from the needs of a home cook. Maybe you’re all of these things. We wanted to provide plenty of high-quality options that are worth your money and perform beyond the standards. Tablet stands can range widely in price, depending on the complexity of the stand and the quality of the materials. The cheapest tablet stands tend to be simple supports made out of plastic. The more expensive ones are usually made from metal and may be mountable. Generally, a tablet holder will go for between $5 and $30, but some can be hundreds of dollars. This is an amazing tablet stand which is also amazingly cheap. No matter what kind of tablet you have (unless you’ve got a very large one), this affordable product will help you prop it up at a variety of angles, no matter where you’re working. The unique tripod design is also extremely sturdy. The Amazon Basics Adjustable Tablet Stand is meant to be simple and sleek. It’s made from sturdy plastic and can be collapsed down into a small stick that can fit into your pocket. It’s only available in black, but this is a versatile color that will go with nearly anything, and it’s professional-enough to bring into the boardroom if necessary. If what you want is functional, affordable and on-point, then what you need is the The Amazon Basics Adjustable Tablet Stand. The Amazon Basics Adjustable Tablet Stand is sturdy and well-made. Most reviewers love this tablet holder and find that it basically works on any sort of flat surface, from a desk to a ledge to an airplane tray table. It has a professional look, and the portability is a major plus. Provided that you’re wearing jeans or slacks with average-sized pockets, you’ll be able to slide this in there without any problems. One of the cons is that it’s only available in black, which may be off-putting to those who like to have a bit more color in their lives. Additionally, if you don’t have a flat surface handy, the Amazon Basics Adjustable Tablet Stand can’t help you much. You can purchase the Amazon Basics Adjustable Tablet Stand for $8.99. The Amazon Basics Adjustable Tablet stand can be purchased from Amazon. The Amazon Basics Adjustable Tablet Stand offers a one-year limited warranty from the date of purchase. Those of you who like to relax in bed with Netflix can rejoice, for the tablet stand of your dreams is a reality. The GEEPIN Clamp Mount Table Stand has an incredible gooseneck body, which means that it can be curved in a variety of shapes and can hold a tablet at any angle. Plus, it doesn’t require a flat surface. The GEEPIN Clamp Mount Table Stand clamps onto anything from a table to a chairside to a headboard, and it will support your tablet anywhere. If you want to lay in bed and not risk dropping your tablet on your face while watching, this is a great tablet stand. Holds the largest Tablets and Smartphones from 4" to 12" Compatible the iPad Pro securely in its large, soft closing jaws. The silica gel coating will keep your phone or tablet secure and undamaged. 100% Satisfaction Guarantee, Easy to install. The most important part of the GEEPIN Clamp Mount Table Stand is the gooseneck, which gives this tablet stand its flexibility and allows you to use it almost anywhere. Reviewers give the GEEPIN Clamp Mount Table Stand particularly high marks when used on airplanes, as it can be easily clamped to a tray table or even an armrest to provide hands-free viewing even in the most cramped spaces. One advantage of the GEEPIN Clamp Mount Table Stand is how versatile it is. This stand can fit a wide variety of different tablets, thanks to how adjustable it is, and since it can clamp to surfaces, it’s a great solution for kids who might have buttery fingers when it comes to their tablets. With the GEEPIN Clamp Mount Table Stand, it’s impossible to drop a tablet, as it’s conveniently suspended. The main con of the GEEPIN Clamp Mount Table Stand is that it’s not very professional-looking, and probably should be kept out of business meetings. It also does require a bit of space to be used. While it’s useful on an airplane with defined seats, it won’t be as helpful on public transportation in general. You can buy the GEEPIN Clamp Mount Table Stand for $17.60. The GEEPIN Clamp Mount Table Stand can be purchased on Amazon. There is a 100 percent satisfaction guarantee on the GEEPIN Clamp Mount Table Stand. If you’re looking for something that is sleek, professional and will make you look good in the boardroom, you’re looking for the Lamicall Adjustable Tablet Stand. This stand takes a leaf from the books of Apple, and this beautiful metal stand shows it off with style. If you use the Lamicall Adjustable Tablet Stand with your tablet, you will look like you are using a miniature computer, particularly if you pair it with an iPad, but it looks great with any sort of tablet. 【 COMPATIBILITY 】 Tablet stand applies to 4-13 inch Tablet PC such as new iPad 2017 Pro 9.7 / 10.5, Air mini Surface Pro, Samsung Tablet. If you use a tablet larger than 12" and found it's not stable to use, kindly set it horizontally, which helps maintain more stability. 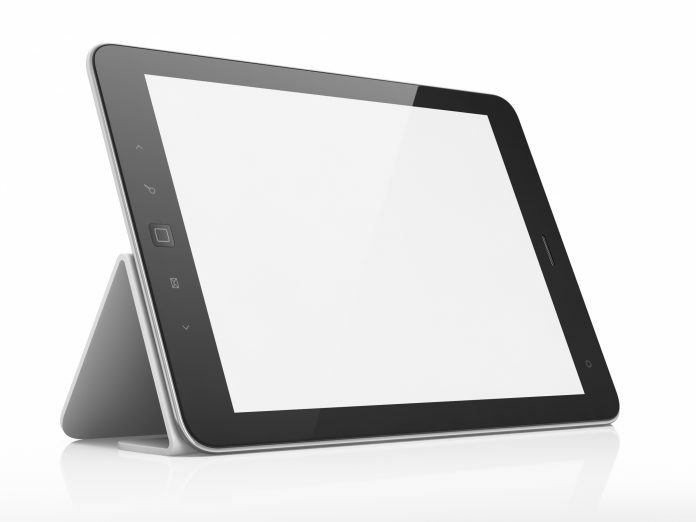 The best feature of the Lamicall Adjustable Tablet Stand is its look. It can make a tablet look like a true-to-life computer. It also has protective rubber wrapped around the bottom of the stand, so that your electronics won’t be scratched. The Lamicall Adjustable Tablet Stand is also adjustable to a variety of different angles. The biggest pro of the Lamicall Adjustable Tablet Stand is definitely its appearance. This is a tablet stand with the professional in mind. The adjustable nature of the stand is also a plus, as you can view it optimally from many angles. If you pair it with a tablet keyboard, it’s going to look like a miniature computer. The main con of the Lamicall Adjustable Tablet Stand is that it’s more expensive than other tablet stands on the market. If you don’t need the look, you might be just as well with a more standard plastic tablet holder. The Lamicall Adjustable Tablet Stand is available for $15.99. The Lamicall Adjustable Tablet Stand can be purchased on Amazon. There is a lifetime warranty on the Lamicall Adjustable Tablet Stand. This is a great-looking tablet stand that mimics the great looks of the Lamicall Adjustable Tablet Stand in some ways, but the iKross Kitchen Tablet Mount Stand has an additional feature: it can be mounted to the wall or under cabinets. Even better, the iKross Kitchen Tablet Mount Stand can be easily removed from a wall-mount so that it can be used as a regular tablet stand. EXCELLENT COMPATIBILITY: The iKross tablet bracket adjusts from 6 to 8.7 inches to accommodate majority of the 7 to 13 inch tablets including Samsung Galaxy Tab S4 10.5/Tab A 10.5, Microsoft Surface Go 10-inch, New iPad 9.7-inch 2017 Edition, iPad Pro 12.9 / 9.7, iPad Pro 12.9, iPad Air 2, iPad Mini 4, Microsoft Surface Pro 4 3, Surface 3 10.8, Samsung Galaxy Tab A 7-Inch / 8-inch / 9.7-inch / Galaxy Tab S3, Dragon Touch X10, A1X Plus, Asus Transformer Book 10.1 T100. MODERN DESIGN: The sleek and modern holder perfectly complements the kitchen countertop, cashier table, desktop and nightstand. Multiple mounting options are designed for convenience and versatility for every viewing angle. View and work on your tablet without the fear of the device tipping over. 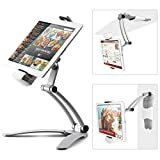 STURDY CONSTRUCTION: Heavy duty brushed aluminum base is fully adjustable and folds down with removeable tablet holder for clutter free viewing. EASY OPERATION: 360 Degree adjustable holder for most ideal and comfortable viewing angles. Simple release button on the holder allows easy mount and dismount. EASY INSTALLATION: Supplied with 2 under cabinet/wall mounting plates and installation hardware for desired mounting location. Access all your favorite digital & online recipes, go to apps, and watch movies on your tablet! If you’re looking to purchase the iKross Kitchen Tablet Mount Stand, you’re searching for the flexibility that this tablet stand provides. Many tablet stands on the market are either flat-surface only, or are a permanent mount. The fact that the iKross Kitchen Tablet Mount Stand is convertible gives it a powerful and unique feature, along with its great looks. Like the Lamicall Adjustable Tablet Stand, the iKross Kitchen Tablet Mount Stand has a professional look that will take you to the boardroom in a breeze. The iKross Kitchen Tablet Mount Stand will make you look very professional. Plus, the fact that you can slide it into its under-the-cabinet kitchen mount to cook dinner when you get home makes it a workhorse. However, the iKross Kitchen Tablet Mount Stand is pretty expensive, and if you don’t think that you need the mount, then you’re probably better off with the cheaper Lamicall Adjustable Tablet Stand if you just want the professional look of metal. You can get the iKross Kitchen Tablet Mount Stand for $27.99. The iKross Kitchen Tablet Mount Stand is available from Amazon. The iKross Kitchen Tablet Mount Stand comes with a one-year limited warranty from date of purchase. 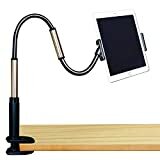 Again, the world of tablet holders is so vast that it’s rather hard to choose just one, given that there are so many ways that you might want to use your tablet holder. But we have to say that we’re very impressed with the Lamicall Adjustable Tablet Stand. It’s got an incredibly sleek look, and we absolutely adore how it mimics the appearance of an Apple computer, just in miniature. This one would work well for somebody who really wants the functionality of a tablet, but the performance of a computer. It’s slick, it looks great, it’s durable, and it can even support tablets that have covers on them, provided that the cover is thin enough. There are few options on the market that look this good and perform so well. Plus, we really like that Lamicall is confident enough in their product to offer a lifetime warranty. You don’t see that on many tablet holders in the market. The price is also a big bonus. It’s more expensive than many of the plastic options on the market, but for the upgrade to sleek metal, it’s worth the few extra dollars. For those who are looking for a great-looking but sturdy option, you can’t get much better than the Lamicall Adjustable Tablet Stand.